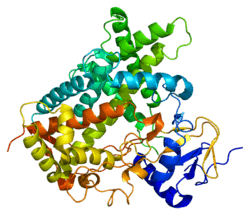 Cytochrome P450 2C19 (abbreviated CYP2C19) is an enzyme. This protein, a member of the cytochrome P450 mixed-function oxidase system, is involved in the metabolism of xenobiotics, including many proton pump inhibitors and antiepileptics. In humans, the CYP2C19 protein is encoded by the CYP2C19 gene. CYP2C19 is a liver enzyme that acts on 10-15% of drugs in current clinical use, including the antiplatelet clopidogrel (Plavix), drugs that treat pain associated with ulcers, such as omeprazole, antiseizure drugs such as mephenytoin, the antimalarial proguanil, and the anxiolytic diazepam. CYP2C19 has been annotated as (R)-limonene 6-monooxygenase and (S)-limonene 6-monooxygenase in UniProt. The gene encodes a member of the cytochrome P450 superfamily of enzymes. These proteins are monooxygenases that catalyze many reactions involved in drug metabolism and synthesis of cholesterol, steroids and other lipids. This protein localizes to the endoplasmic reticulum and is known to metabolize many drugs. Polymorphism within this gene is associated with variable ability to metabolize mephenytoin, known as the poor metabolizer and extensive metabolizer phenotypes. The gene is located within a cluster of cytochrome P450 genes on chromosome no.10 arm q24. eicosapentaenoic acid to various epoxyeicosatetraenoic acids (also termed EEQs). Along with CYP219, CYP2C8, CYP2C9, CYP2J2, and possibly CYP2S1 are the main producers of EETs and, very likely EEQs, EDPs, and the epoxides of linoleic acid. Genetic polymorphism (mainly CYP2C19*2, CYP2C19*3 and CYP2C19*17) exists for CYP2C19 expression, with approximately 3–5% of Caucasian and 15–20% of Asian populations being poor metabolizers with no CYP2C19 function. This may reduce the efficacy of clopidogrel (Plavix). In patients with an abnormal CYP2C19 variant certain benzodiazepines should be avoided, such as diazepam (Valium), lorazepam (Ativan), oxazepam (Serax), and temazepam (Restoril). On the basis of their ability to metabolize (S)-mephenytoin or other CYP2C19 substrates, individuals can be classified as extensive metabolizers (EM) or poor metabolizers (PM). Eight variant alleles (CYP2C19*2 to CYP2C19*8) that predict PMs have been identified. The following is a table of selected substrates, inducers and inhibitors of CYP2C19. Where classes of agents are listed, there may be exceptions within the class. Strong being one that causes at least a 5-fold increase in the plasma AUC values, or more than 80% decrease in clearance of substrates. Moderate being one that causes at least a 2-fold increase in the plasma AUC values, or 50-80% decrease in clearance of substrates. Weak being one that causes at least a 1.25-fold but less than 2-fold increase in the plasma AUC values, or 20-50% decrease in clearance of substrates. ↑ Romkes M, Faletto MB, Blaisdell JA, Raucy JL, Goldstein JA (April 1991). "Cloning and expression of complementary DNAs for multiple members of the human cytochrome P450IIC subfamily". Biochemistry. 30 (13): 3247–55. doi:10.1021/bi00227a012. PMID 2009263. ↑ Gray IC, Nobile C, Muresu R, Ford S, Spurr NK (July 1995). "A 2.4-megabase physical map spanning the CYP2C gene cluster on chromosome 10q24". Genomics. 28 (2): 328–32. doi:10.1006/geno.1995.1149. PMID 8530044. ↑ "Cytochrome P450 2C19 Genotyping". Genelex. Retrieved 2 December 2016. ↑ "Cytochrome P450 2C19 (CYP2C19) Genotype". Mayo Medical Laboratories. June 2013. ↑ "Entrez Gene: CYP2C19 cytochrome P450, family 2, subfamily C, polypeptide 19". 1 2 Wagner K, Vito S, Inceoglu B, Hammock BD (October 2014). "The role of long chain fatty acids and their epoxide metabolites in nociceptive signaling". Prostaglandins & Other Lipid Mediators. 113-115: 2–12. doi:10.1016/j.prostaglandins.2014.09.001. PMC 4254344 . PMID 25240260. ↑ Fischer R, Konkel A, Mehling H, Blossey K, Gapelyuk A, Wessel N, von Schacky C, Dechend R, Muller DN, Rothe M, Luft FC, Weylandt K, Schunck WH (June 2014). "Dietary omega-3 fatty acids modulate the eicosanoid profile in man primarily via the CYP-epoxygenase pathway". Journal of Lipid Research. 55 (6): 1150–64. doi:10.1194/jlr.M047357. PMC 4031946 . PMID 24634501. ↑ Bertilsson L (September 1995). "Geographical/interracial differences in polymorphic drug oxidation. Current state of knowledge of cytochromes P450 (CYP) 2D6 and 2C19". Clinical Pharmacokinetics. 29 (3): 192–209. doi:10.2165/00003088-199529030-00005. PMID 8521680. 1 2 3 Desta Z, Zhao X, Shin JG, Flockhart DA (2002). "Clinical significance of the cytochrome P450 2C19 genetic polymorphism". Clinical Pharmacokinetics. 41 (12): 913–58. doi:10.2165/00003088-200241120-00002. PMID 12222994. ↑ Forest, Tennant (2014). "American Association of Clinical Chemistry Annual Meeting 2014: Utility of Genetic Testing in Practical Pain Management". AutoGenomics. 1 2 3 Center for Drug Evaluation and Research. "Drug Interactions & Labeling - Drug Development and Drug Interactions: Table of Substrates, Inhibitors and Inducers". FDA. Retrieved 2016-06-01. 1 2 3 4 5 6 7 8 9 10 11 12 13 14 15 16 17 18 19 20 21 22 23 24 25 26 27 28 29 30 31 32 33 34 35 36 37 38 39 40 41 Flockhart, DA (2007). "Drug Interactions: Cytochrome P450 Drug Interaction Table". Indiana University School of Medicine. Retrieved 10 July 2011. 1 2 3 4 5 6 7 8 9 10 11 12 13 14 15 16 17 18 19 20 Sjöqvist, Folke. "Fakta för förskrivare: Interaktion mellan läkemedel" [Facts for prescribers: Interaction between drugs]. FASS Vårdpersonal (in Swedish). Retrieved 10 July 2011. ↑ Zhu AZ, Zhou Q, Cox LS, Ahluwalia JS, Benowitz NL, Tyndale RF (November 2014). "Gene variants in CYP2C19 are associated with altered in vivo bupropion pharmacokinetics but not bupropion-assisted smoking cessation outcomes". Drug Metabolism and Disposition. 42 (11): 1971–7. doi:10.1124/dmd.114.060285. PMID 25187485. ↑ Miyazawa M, Shindo M, Shimada T (May 2002). "Metabolism of (+)- and (-)-limonenes to respective carveols and perillyl alcohols by CYP2C9 and CYP2C19 in human liver microsomes". Drug Metabolism and Disposition. 30 (5): 602–7. doi:10.1124/dmd.30.5.602. PMID 11950794. ↑ Zhang Y, Si D, Chen X, Lin N, Guo Y, Zhou H, Zhong D (July 2007). "Influence of CYP2C9 and CYP2C19 genetic polymorphisms on pharmacokinetics of gliclazide MR in Chinese subjects". British Journal of Clinical Pharmacology. 64 (1): 67–74. doi:10.1111/j.1365-2125.2007.02846.x. PMC 2000619 . PMID 17298483. ↑ Xu H, Williams KM, Liauw WS, Murray M, Day RO, McLachlan AJ (April 2008). "Effects of St John's wort and CYP2C9 genotype on the pharmacokinetics and pharmacodynamics of gliclazide". British Journal of Pharmacology. 153 (7): 1579–86. doi:10.1038/sj.bjp.0707685. PMC 2437900 . PMID 18204476. ↑ Park JY, Kim KA, Kim SL (November 2003). "Chloramphenicol is a potent inhibitor of cytochrome P450 isoforms CYP2C19 and CYP3A4 in human liver microsomes". Antimicrobial Agents and Chemotherapy. 47 (11): 3464–9. doi:10.1128/AAC.47.11.3464-3469.2003. PMC 253795 . PMID 14576103. ↑ Sager JE, Lutz JD, Foti RS, Davis C, Kunze KL, Isoherranen N (June 2014). "Fluoxetine- and norfluoxetine-mediated complex drug-drug interactions: in vitro to in vivo correlation of effects on CYP2D6, CYP2C19, and CYP3A4". Clinical Pharmacology and Therapeutics. 95 (6): 653–62. doi:10.1038/clpt.2014.50. PMC 4029899 . PMID 24569517. 1 2 Perucca, Emilio; Levy, René H. (2002). "Combination Therapy and Drug Interactions". In Levy, René H.; Mattson, Richard H.; Meldrum,, Brian S.; Perucca, Emilio. Antiepileptic drugs (5th ed.). Hagerstwon, MD: Lippincott Williams & Wilkins. p. 100. ISBN 0-7817-2321-3. OCLC 848759609. ↑ Wen X, Wang JS, Neuvonen PJ, Backman JT (January 2002). "Isoniazid is a mechanism-based inhibitor of cytochrome P450 1A2, 2A6, 2C19 and 3A4 isoforms in human liver microsomes". European Journal of Clinical Pharmacology. 57 (11): 799–804. PMID 11868802. ↑ Chen XP, Tan ZR, Huang SL, Huang Z, Ou-Yang DS, Zhou HH (March 2003). "Isozyme-specific induction of low-dose aspirin on cytochrome P450 in healthy subjects". Clinical Pharmacology and Therapeutics. 73 (3): 264–71. doi:10.1067/mcp.2003.14. PMID 12621391. Goldstein JA, de Morais SM (December 1994). "Biochemistry and molecular biology of the human CYP2C subfamily". Pharmacogenetics. 4 (6): 285–99. doi:10.1097/00008571-199412000-00001. PMID 7704034. Smith G, Stubbins MJ, Harries LW, Wolf CR (December 1998). "Molecular genetics of the human cytochrome P450 monooxygenase superfamily". Xenobiotica. 28 (12): 1129–65. doi:10.1080/004982598238868. PMID 9890157. Ding X, Kaminsky LS (2003). "Human extrahepatic cytochromes P450: function in xenobiotic metabolism and tissue-selective chemical toxicity in the respiratory and gastrointestinal tracts". Annual Review of Pharmacology and Toxicology. 43: 149–73. doi:10.1146/annurev.pharmtox.43.100901.140251. PMID 12171978. Meier UT, Meyer UA (December 1987). "Genetic polymorphism of human cytochrome P-450 (S)-mephenytoin 4-hydroxylase. Studies with human autoantibodies suggest a functionally altered cytochrome P-450 isozyme as cause of the genetic deficiency". Biochemistry. 26 (25): 8466–74. doi:10.1021/bi00399a065. PMID 3442670. De Morais SM, Wilkinson GR, Blaisdell J, Meyer UA, Nakamura K, Goldstein JA (October 1994). "Identification of a new genetic defect responsible for the polymorphism of (S)-mephenytoin metabolism in Japanese". Molecular Pharmacology. 46 (4): 594–8. PMID 7969038. Romkes M, Faletto MB, Blaisdell JA, Raucy JL, Goldstein JA (February 1993). "Cloning and expression of complementary DNAs for multiple members of the human cytochrome PH50IIC subfamily". Biochemistry. 32 (5): 1390. doi:10.1021/bi00056a025. PMID 8095407. Goldstein JA, Faletto MB, Romkes-Sparks M, Sullivan T, Kitareewan S, Raucy JL, Lasker JM, Ghanayem BI (February 1994). "Evidence that CYP2C19 is the major (S)-mephenytoin 4'-hydroxylase in humans". Biochemistry. 33 (7): 1743–52. doi:10.1021/bi00173a017. PMID 8110777.
de Morais SM, Wilkinson GR, Blaisdell J, Nakamura K, Meyer UA, Goldstein JA (June 1994). "The major genetic defect responsible for the polymorphism of S-mephenytoin metabolism in humans". The Journal of Biological Chemistry. 269 (22): 15419–22. PMID 8195181. Karam WG, Goldstein JA, Lasker JM, Ghanayem BI (October 1996). "Human CYP2C19 is a major omeprazole 5-hydroxylase, as demonstrated with recombinant cytochrome P450 enzymes". Drug Metabolism and Disposition. 24 (10): 1081–7. PMID 8894508. Xiao ZS, Goldstein JA, Xie HG, Blaisdell J, Wang W, Jiang CH, Yan FX, He N, Huang SL, Xu ZH, Zhou HH (April 1997). "Differences in the incidence of the CYP2C19 polymorphism affecting the S-mephenytoin phenotype in Chinese Han and Bai populations and identification of a new rare CYP2C19 mutant allele". The Journal of Pharmacology and Experimental Therapeutics. 281 (1): 604–9. PMID 9103550. Guengerich FP, Johnson WW (December 1997). "Kinetics of ferric cytochrome P450 reduction by NADPH-cytochrome P450 reductase: rapid reduction in the absence of substrate and variations among cytochrome P450 systems". Biochemistry. 36 (48): 14741–50. doi:10.1021/bi9719399. PMID 9398194. Ferguson RJ, De Morais SM, Benhamou S, Bouchardy C, Blaisdell J, Ibeanu G, Wilkinson GR, Sarich TC, Wright JM, Dayer P, Goldstein JA (January 1998). "A new genetic defect in human CYP2C19: mutation of the initiation codon is responsible for poor metabolism of S-mephenytoin". The Journal of Pharmacology and Experimental Therapeutics. 284 (1): 356–61. PMID 9435198. Ibeanu GC, Goldstein JA, Meyer U, Benhamou S, Bouchardy C, Dayer P, Ghanayem BI, Blaisdell J (September 1998). "Identification of new human CYP2C19 alleles (CYP2C19*6 and CYP2C19*2B) in a Caucasian poor metabolizer of mephenytoin". The Journal of Pharmacology and Experimental Therapeutics. 286 (3): 1490–5. PMID 9732415. Ibeanu GC, Blaisdell J, Ghanayem BI, Beyeler C, Benhamou S, Bouchardy C, Wilkinson GR, Dayer P, Daly AK, Goldstein JA (April 1998). "An additional defective allele, CYP2C19*5, contributes to the S-mephenytoin poor metabolizer phenotype in Caucasians". Pharmacogenetics. 8 (2): 129–35. doi:10.1097/00008571-199804000-00006. PMID 10022751. Foster DJ, Somogyi AA, Bochner F (April 1999). "Methadone N-demethylation in human liver microsomes: lack of stereoselectivity and involvement of CYP3A4". British Journal of Clinical Pharmacology. 47 (4): 403–12. doi:10.1046/j.1365-2125.1999.00921.x. PMC 2014231 . PMID 10233205. Ibeanu GC, Blaisdell J, Ferguson RJ, Ghanayem BI, Brosen K, Benhamou S, Bouchardy C, Wilkinson GR, Dayer P, Goldstein JA (August 1999). "A novel transversion in the intron 5 donor splice junction of CYP2C19 and a sequence polymorphism in exon 3 contribute to the poor metabolizer phenotype for the anticonvulsant drug S-mephenytoin". The Journal of Pharmacology and Experimental Therapeutics. 290 (2): 635–40. PMID 10411572.